“Running Away From Love”, a brand new song from VOODOO CIRCLE, the band featuring PRIMAL FEAR members Alex Beyrodt (guitar), Mat Sinner (bass) and Francesco Jovino (drums), can be streamed below. 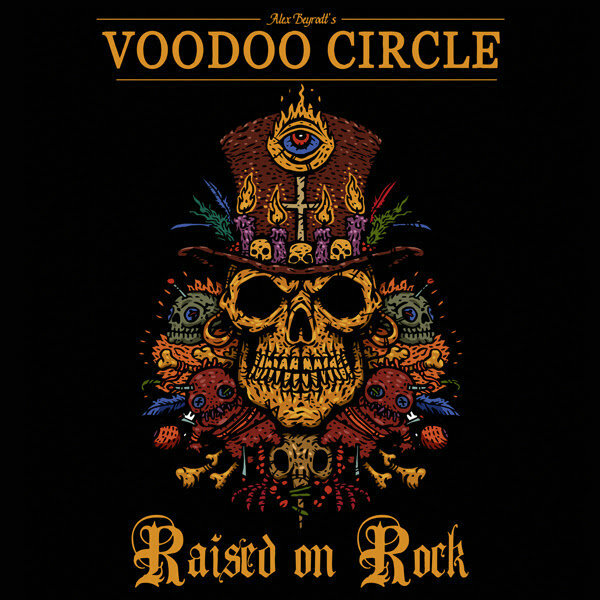 The track is taken from VOODOO CIRCLE‘s fifth album, “Raised On Rock”, which will be released on February 9 as CD, digipak and limited colored vinyl via AFM Records. If you consider the songs on “Raised On Rock” to be an indicator of the current emotional condition their most important protagonists find themselves in, there seems to be no reason to worry about band founder, guitarist and main composer Alex Beyrodt in particular. Thanks to Beyrodt‘s excellent songwriting — as usual inspired by renowned sources such as WHITESNAKE, RAINBOW, DEEP PURPLE, LED ZEPPELIN and Jimi Hendrix — and his outstanding guitar performance, which brings to mind icons from Ritchie Blackmore through Jimmy Page to John Sykes, this recording oozes pure, unadulterated fervor. This exuberant energy, however, isn’t the merit of Beyrodt alone but, without doubt, also that of his colleagues Sinner, Jovino and — last but not least — new vocalist Herbie Langhans (AVANTASIA). Beyrodt and Langhans met in 2015 at the Wacken Open Air, when they belted out the Wacken anthem together from the gigantic Black Stage. With Langhans as the group’s new frontman, the stylistic direction of the VOODOO CIRCLE compositions hasn’t significantly changed — unlike the general flair of the material. “I feel that the band sounds even more autonomous, a little less bluesy and much meatier with Herbie at the mic,” Beyrodt enthuses. “This allowed me to work on ideas which would probably not really have suited his predecessor David Readman but are absolutely perfect for Herbie‘s powerful voice.” The VOODOO CIRCLE boss is referring to numbers such as “Running Away From Love”, with its anthemnic vocal melody and the subsequent midtempo rock track “Higher Love”, which went down a treat with the audience at its official live debut. Says Beyrodt: “In the beginning, the song caused me a number of sleepless nights because I felt that there was still one small, all-important element missing. Then I came up with the idea of the talk box, which lends it a different, very interesting note. To me, ‘Higher Love’ in its current form is one of the best VOODOO CIRCLE numbers of all time.” The almost six-and-a-half-minute “Dreamchaser”, with its Blackmore references, dates back to the very early days of the group. Beyrodt had originally composed it for the 2008 VOODOO CIRCLE debut album but wasn’t entirely satisfied with the result at the time. “The arrangement of the number was changed and overhauled repeatedly over the years, now it’s matured to the point where it was ready for recording,” he says. “You Promised Me Heaven” sees Beyrodt delve deep into the Page/Sykes bag of tricks, a veritable guitar festival featuring Telecaster, Strat and Les Paul sounds which support the bluesy feel of the track, adding even greater depth. Talking of the sound: “Raised On Rock” was mixed and mastered by Jacob Hansen (VOLBEAT, U.D.O. ), whose unerring instinct for dynamics and frequencies lends the recording its modern touch. And another musician contributed significantly to the tight overall impression of “Raised On Rock”: the keyboards were manned by Corvin Bahn (SAXON, Uli Jon Roth).